A stele of a Buddha or bodhisattva image in Purang in Ngari Prefecture, Tibetan Autonomous Prefecture, exudes the courtly mystique and power of the ancient Tibetan imperium (Tubo) during the first diffusion of Buddhism. 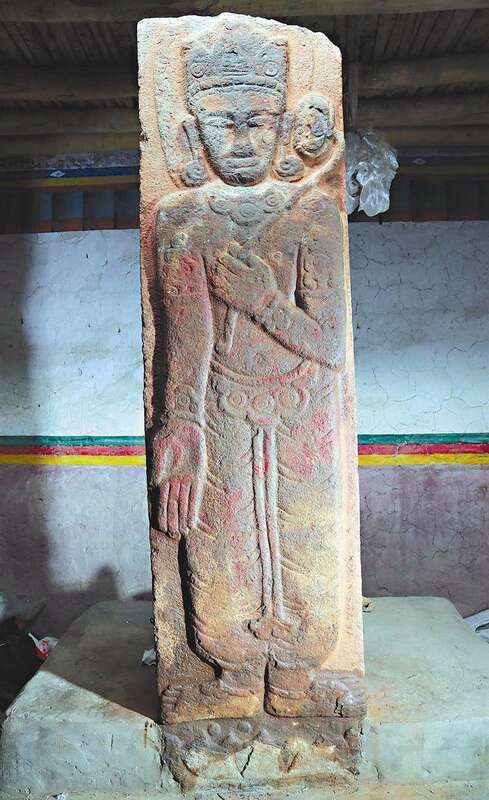 Functioning perhaps as a donative monument or a pillar of a long-lost temple, this stele was erected in either 826 or 838: either during or shortly after the reign of Trisuk Detsen (Ralpacan), the last of the Tibetan Empire’s three “Dharma kings,” or chösgyal. This is the story of the stele… or perhaps just one of many. Who truly knows its mysteries, the knowledge behind that sculpture’s enigmatic smile? “Regicide!” growled the illustrious general. He didn’t want to believe it. Dro Trisumje Taknang slammed his grimy fist on the wooden table inside the makeshift shelter his troops had built to protect from the howling wind outside. He shouted out expletives, venting his despair at the news he had just heard from a panicked messenger. The summer palace near Lhasa was in chaos and the emperor of Tubo drew no breath. Strangled by two of his own ministers! They were shouting something about the preservation of the old ways, the ancient sacrifices the imperial court had made to the spirits of the sky and snowy mountains before the smiling idols of gold came along, bewitching the ancestral kings with high ideas of rebirth and karma. Were any of the murderers from his extended family, the princely Dro clan? Or perhaps, he pondered, they might have been from the other side, their rivals over at the house of Bro. He prayed that was the case. For if he had the misfortune of sharing any remnant of blood with the assassins, the supporters of His Majesty Tritsuk Detsen would surely hunt him down to the ends of the earth and plunge a coral blade through his sputtering heart. He broke into a cold sweat, despite the bitingly cold weather that made his breath visible. He didn’t want the Dro to end up like the once-mighty Gar, whose surviving members committed suicide shortly after the majority – 2,000 of them – were massacred by agents of a deceased emperor, Tridu Songtsen. And that was simply on the basis of a political convenience, for the sake of an alliance with the Tang Chinese. To be punished for actual violence against the emperor – the thought was terrifying. Any pain inflicted on a chösgyal – a monarch who devoted his reign to the Buddhist Dharma – would be returned a thousandfold, be you an aristocrat or beggar. Run a blade against his skin, and the flesh would be flayed off your bones and those bones ground to dust in the palace square. There had only been three chösgyal: Songtsen Gampo, Trisong Detsen, and Trisuk Detsen. And now the final chösgyal was dead. He rubbed his hands together. Yes, it would be fine. Everyone knew it was those Bro crooks who whipped up resentment among the priestly archons that advised the kings of old, the descendants of Nyari Tsenpo. 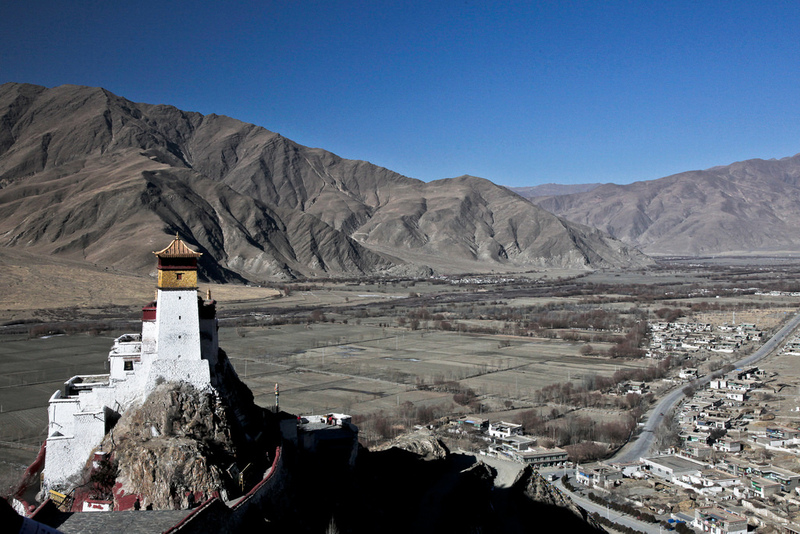 Nyari Tsenpo might have been the first semi-divine founder of the Yarlung Dynasty, whose royal ancestors took their name from the valley over which Nyari Tsenpo’s Grand Fort, the Yungbulakang Palace, overlooked. Chunk by chunk of conquered territory, carcass by blood-soaked carcass of rival warlord, the Yarlung Kingdom became an imperial power. Songtsen Gampo, the first chösgyal, was the apotheosis of this transformed Tibetan identity, uniting all under his body politic of Tubo. Many of the Buddhist sculptures and artifacts from his day, many of which had been brought over by his Chinese and Nepalese princess-wives, Wencheng and Bhrikuti. They were instrumental in turning his religious sympathies to Buddhism, a far more prestigious religion hosted by the Tang Empire to the east and the Indic kingdoms. The Bro nobles had long ago attempted to play both sides, pitting the Buddhist abbots against the courtly priests of the imperial family. They were fools, thought Trisumje. The Bro hated the emperor for weakening the aristocracy’s privileges, and they especially disliked his willingness to ally with and learn from the Tang, whom the chösgyal had described as a relationship between uncle and nephew – with Tubo playing the junior role. “They say Langdarma is the favourite to succeed His Majesty,” said Dorje, cutting into Trisumje’s dark thoughts. “He’s promised to protect the monasteries. He’ll continue to patronize them. And he’s making a trip to Samye. Try to prove his loyalty to the abbot.” Samye was the most ancient, officially-sanctioned Buddhist monastery in the Tibetan Empire. 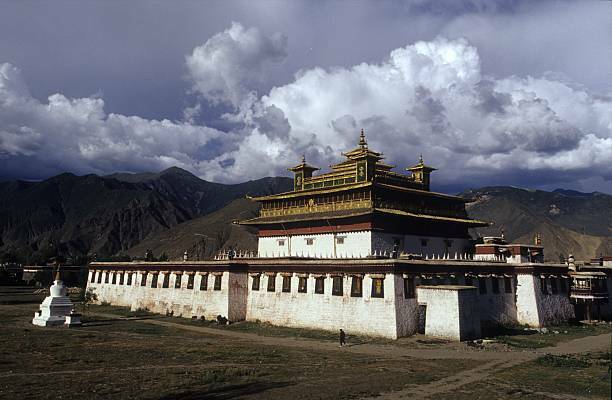 It was built by the second of the chösgyal, the fearsome Trisong Detsen and friend to the greatest Buddhist minds to grace Tibet: the scholar Shantarakshita and the mystic guru Padmasambhava. Those were the good old days: now, who knew whether the divided Tibetan abbots and nobles could bridge their differences? There was a pregnant, tense silence in the tent as the wind continued to howl loudly outside. “D’you want to see something magnificent, milord?” said Dorje finally. “What have you got?” asked Trisumje. Dorje waved his hand, and the groaning rolling of wooden wheels could be heard outside. Trisumje peeked out the tent flap, so see a large cart with a large blanket covering a lumpy, large object. “Pull it down,” shouted Dorje. The servants obeyed, and the general gasped as his beady eyes fell upon a beautiful, horizontally prone stele. Carved on it was the most beautiful human form he’d ever seen. It was more than human: its beauty was divine. He knew he was risking his post, perhaps even his life. Who knew if this pillar belonged to some member of the imperial house? But as the entirety of the Tibetan court creaked ominously under the weight of its own tensions, he couldn’t imagine abandoning these mementos of the Buddhist presence in his homeland to their fate. After all, a great period of danger and chaos was going to descend on the Tibetan dominions. No matter how many battles he won against the future – against the Caliphate further west, or against the Uighur khagans, or even against the Tang emperor – he could feel the implosion imminent. “May this Buddha of stone survive long after we’re gone, and long after our empire has been reduced to dust and memory,” he whispered.